Folger Theatre launches its 2014-15 season with a strikingly imaginative production of Julius Caesar by William Shakespeare, a play whose contradictions and cruelties mirror the bewildering politics of our time. On the eve of an important midterm election, it is well to be reminded of what politics can do, and what it can’t do, to improve the lot of humankind. L to R: Mark Antony (Maurice Jones) and Julius Caesar (Michael Sharon). Photo by Jeff Malet. This is a Caesar for the 21st Century, with important things to say about how we live in our newly terrifying world. It features ensemble members dressed as the Fates, scattering roses as characters die; uniforms from several different wars; gas masks; explosions; and human beings who reduce others to abstractions in order to kill them. Caesar, military genius and writer, consul and dictator, brutal Imperator and forgiving enemy, was and is the colossus of his age. At the time of his murder, he had already implemented reforms which benefited the Roman people. He was known for clemency in victory, not so much for altruistic reasons but because he believed it would lead to better relations with the defeated. In this he was tragically wrong, as several of his assassins were people he had pardoned and whom he considered his friends. Like many such extraordinary individuals, he attracted obsessives. Cassius, in an exceptionally fine performance by Louis Butelli, is nearly spitting with rage that Caesar has not only surpassed him and slighted him, but that Caesar has the effrontery to exist at all. The more moderate Brutus (Anthony Cochrane) cares for Caesar but is intrigued by the idea of assassinating him, as if one overwhelming blow struck at an arrogant, supremely talented ruler would bring back the golden days of the Republic and save Rome. Cochrane plays Brutus as a complex, ultimately unknowable man, who smiles nervously and repeatedly, carefully applies incorrect analyses to almost everything, and seems to condemn Caesar to death almost tenderly, not so much for anything he has done but for what he might become. The focus of the play is, in one sense, on the uneasy friendship between Brutus and Cassius; a friendship which ultimately destroys them both. Michael Sharon is very much the successful general; his Caesar is, far from being aging and vulnerable, at the top of his game and very much aware of it. He is especially good at conveying Caesar’s ease within himself, and his belief in his own overwhelming superiority. The fact that he actually is superior makes it even more infuriating to his ambitious rivals. Cassius (Louis Butelli) has a few choice words for Brutus (Anthony Cochrane). Photo by Jeff Malet. There is a sense that from the beginning, the fix is in. Once the conspirators have connected and established their plan, nothing will stop it. In the run-up to the Iraq war, if you were watching CNN, the excitement was almost palpable. Once the emotional process began, it seemed the only sane thing to do if you happened to disagree was get out of the way. Reason was no longer part of the argument. After Caesar is gone, there is a scene in which Octavius (JaBen Early), Mark Antony (Maurice Jones), and Lepidus (Robbie Gay) coldly plan out who is to be murdered next. Family members are not exempt. Instead of a new Republic, there will be another civil war. There are so many wars around the globe at this moment it is difficult to pick one to serve as an example. But these moments of thoughtless cruelty are profoundly and disturbingly familiar. Maurice Jones, as Mark Antony, has a difficult assignment; he must be at the same time the loyal friend of Caesar who is devastated by his loss, as well as the tactical orator who sways the crowd from one position to another with the skills of a trial attorney. In his Folger Shakespeare debut, he displays a powerful presence and a knack for swift transitions from warrior to bereaved friend and back again. He is especially chilling as he sentences his nephew to death. The women of Julius Caesar are, like the men, struggling to survive in an unsettling, violent world. As Portia, wife of Brutus, Shirine Babb conveys with grace the strength of a woman who even in a time when women had few rights is able to assert herself and insist on being a true partner to her husband. Similarly, Diedra LaWan Starnes as Calphurnia shows an elegance of manner and subtle emotion which make it clear why Caesar listens to her despite the restrictions she lives with as a Roman wife. Both women are accomplished performers, and their insights, though disregarded, highlight the men’s inability to look beyond their narrow, abstract perceptions of life and understand the deeper forces which are affecting them all. As the Soothsayer, Nafeesa Monroe deftly executes the many challenging aspects of her role, adding a ghostly and sinister presence when needed. As Lucius, William Vaughan, whose role is expanded in this production, hits every note of his performance perfectly (including a few on the violin). In an interview with DC Theatre Scene’s Chris Henley, Butelli, Cochrane and Director Robert Richmond discussed the trend of using few actors in Shakespeare and double-casting them. It does make sense, particularly, as in this case, where the cuts to the script (the characters of Cicero and Decius Brutus, the tribunes in the first scene, etc.) serve the play, and the actors are expert enough to make each character believable. There is an abundance of talent here, and Joe Brack (Cinna the Conspirator/Titinius), JaBen Early (Metellus Cimber/Octavius Caesar), Maboud Ebrahimzadeh (Casca/Messala), and Robbie Gay (Trebonius/Lepidus) create beautifully detailed portrayals which enhance the production and provide many-layered enjoyment. Director Robert Richmond has posted a Video Postcard in which he goes to Stratford-upon-Avon to gain inspiration for this production. His trip was clearly a great success; the haunting design elements, the overwhelmingly evocative visuals and sound, and the overall sheer impact of his vision brings us an artist’s perspective not only on Caesar but on our own time as well. Mariah Hale (Costume Design) notes that she wanted clothes with no association to any specific time and place, with a simple, utilitarian feel. For the battle scenes, she chose a variety of 20th Century military uniforms, which don’t suggest any particular conflict. These choices add to the timelessness of the piece, and the gas masks are a unique and frightening touch. Calphurnia (Deidra LaWan Starnes) pleads with Caesar (Michael Sharon) to stay at home today. Photo by Jeff Malet. Tony Cisek’s Scenic Design presents an adaptable playing space with two square columns, a staircase, and a mysterious aura which fits in perfectly with the stylized nature of the production. Jim Hunter’s lighting design, like Hale’s costumes, uses imperial purple to great effect. He cites as sources of imagery such phrases as forbidding omen, violently providential storms, and bloody realistic assassination. The results are alternatively lovely and shocking. Sound Designer Eric Shimelonis has provided another unusually original score, with ominous tones of drums, lyrical singing, and even air raid alarms to emphasize different moods and situations. Fight Director Casey Dean Kaleba strikes just the right balance for the fight scenes; they are just believable enough to be fearsome, but not gory enough to detract from the emotional tone of the piece. Resident Dramaturg Michele Osherow has cut the play judiciously and the script is ideally suited to the production. Director Robert Richmond, apart from the remarkable work he has done with actors, offers some truly uncanny visual images which add to the atmosphere of impending doom. A Soothsayer in a cloak sits quietly, smoke rising up behind her. Three people in gas masks sit on the stairs, waiting for their next move and sometimes quietly groaning. The dead Brutus follows the dead Caesar up the long staircase, in an indelible image of the sadness and the costs of war. Julius Caesar plays through December 7, 2014 at Folger Theatre at the Folger Shakespeare Library—201 East Capitol Street, SE, in Washington, DC. For tickets, call the box office at (202) 544-7077, or purchase them online. Review of Julius Caesar by Sophia Howes on DCMetroTheaterArts. 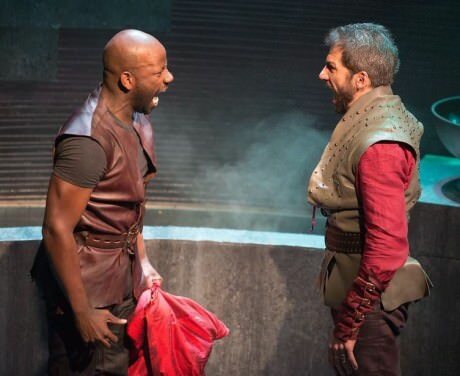 In the Moment: “Julius Caesar’ at Folger Theatre (review) on DCMetroTheaterArts by David Siegel. Spine: ‘Julius Caesar, “et tu Brute?” and You’ by Robert Michael Oliver on DCMetroTheaterArts.